Fall Lambing/Kidding A Blessing Or A Disaster? So lately I have heard a lot of talk about fall lambing and how wonderful it is. However most of the chatter is coming from farmers who haven’t had Sheep long (like they have never actually tried fall lambing ) or they are large conventional money pit Sheep farms. Full disclosure I am a big fan of fall calving but these are 5 reasons that I am not at all a fan of fall lambing and why you should avoid the catastrophe too. 1. They won’t breed. Yes read that again. 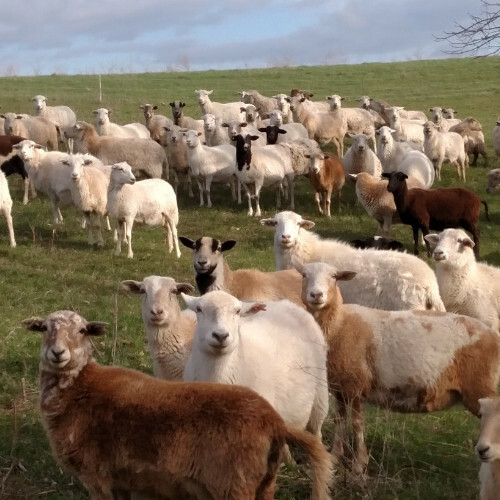 They (your otherwise incredible real world grazing sheep RWGS) will have horrible conception for fall lambing despite being very fertile, hardy, and adapted to their environment. The reason is that RWGS are very photoperiod sensitive. They are what is known as short day breeders. That means they are naturally more fertile as the days get shorter. So a RWGS is most fertile on Dec 31st but is gaining increasing fertility potential after daylight begins to shorten in June, typically by November a RWGS will conceive. Sheep and goats both have five month gestations. So in order to lamb in October (Fall lambing) you have to breed at the end of May. Right at the peak of daylight with daylight still increasing. That is a recipe for disaster. I have heard of flocks at 50% or less conception. The conventional solution is to house them in barns to confuse them about photoperiod. That sounds like fun.....Why would you exhaust yourself trying to get your sheep to breed out of season when waiting just a few months would make breeding season effortless??? When breeding in December we expect all of the sheep to breed. We don’t even pregnancy test because it would be a waste of time and money. They all conceive - easy as that. 2. The lambs die. Sickness, abandoned lambs, tall grass, cold, untimely rains all take their toll. These are losses that we almost never experience in the spring (we have had one cold snap where it rained for 72 hours and stayed below 40 degrees that claimed a lot of lambs but most born then still survived. Just think. By May in Missouri a frost is unlikely. By mid October a frost every third day would not be out of line. That is hard on lambs. In the spring the grass is still just starting to grow so lost lambs and entanglement (lamb gets stuck in grass or just can’t maneuver through it.) are really rare. The wether is mostly pleasant and warming every day and outdoor lambing is a snap. In the fall every day is a day closer to winter and everything could go wrong fast. 3. Predators eat the ones that survive. In the spring all sorts of wild creatures are birthing from squirrels, to rabbits to deer and turkeys. Your sheep should be too. But if your sheep are protected by some good dogs and a donkey, predators will be very nervous about trying anything. And besides from the coyotes perspective why risk death for a lamb snack when you could just eat a baby fawn or bunnies? In contrast, all the real commercial Sheep operations I have talked with that tried (notice the past tense meaning they don’t do it anymore) fall lambing have said that predation losses were a lot higher. This makes sense. The only small edible newly born animal in October would be your lambs. On top of that, the lambs will still be quite small as predation pressure increases through winter. This makes later predation losses of older lambs even more likely. In contrast, spring born lambs are quite large by winter and can handle themselves well enough to evade a predator attack until the guardian animals drive the attackers away. 4. They don’t grow. Fall born lambs have a decreasing plane of nutrition through the winter. That really hampers later growth as they begin eating a lot of forage quite early in life. The conventional fix is too just pour the grain to them. But Sheep have one of the worst grain to gain ratios of any ruminant animal. Translation it doesn’t pay. In the spring the lambs experience an increasing plane of nutrition with abundant grass that allows them to rapidly gain weight throughout the summer. With no extra cost. Plus spring is when most grass farmers have extra forage so why not run it through some lambs and nursing ewes? Contrast that with fall lambing when you are feeding lactating ewes and growing lambs on the least amount of forage you will have all year. 5. It will hurt your pocketbook. Sheep bred for fall won’t breed, the lambs that are born will die of weird stuff, the ones that survive will get eaten, the ones that are getting eaten will need extra expensive feed so the coyotes eating them don’t starve, And you will probably just decide to lamb them in the barn. Talk about a stress load and a pinch on the finances! The solution - don’t outsmart God’s plan for RWGS. Breed them when they will all breed so they can lamb when the weather is great, with abundant forage so the lambs can grow, with tasty bunnies so the lambs aren’t eaten, and sell a lot more pounds of lamb for a lot less work and stress! Translation Lamb on pasture in the spring because it makes a lot of sense.